June 25, 2009 was an unforgettable day. It was a day that the world felt a shock. It was a day that many people are claiming as one of the most emotionally impactful days they've ever experienced. It was the day Michael Jackson died. Since that day, the world has lost one of the most popular and successful entertainers to have ever lived. At a mere 50 years old, Jackson was preparing for a comeback tour that never happened and This Is It is here to show us what that tour may have been like. The movie opens with three little words, "For the fans." I'll tell you straight up, I am not a fan. I appreciate what Michael Jackson has done for music and he deserves to go down as one of the greatest musicians ever, but it's just not my thing. Though I remember seeing the old Thriller video growing up and I was aware of many of his best hits, I never latched onto him like the rest of the world. Perhaps that will sway my opinion, perhaps not. I like to think it won't, but in the interest of full disclosure, no, I am not an avid listener of his music. The footage from this movie is taken from rehearsals for his comeback tour that took place on various days from March through June of 2009. 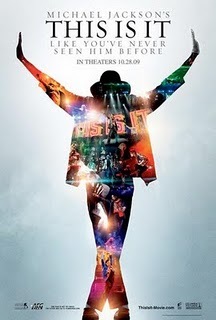 According to the text preceding the film, most of the footage was meant for Jackson's personal library, though some, like the new and improved Thriller video, was meant as a showcase for the tour. This was never planned as an after-the-fact film for all to see, bringing into question the reasoning behind its release. There's really only one answer: to capitalize on his death. Had he not died, this film would have never happened, which is all the evidence you need to know this movie does not have its heart in the right place. The title, This Is It, refers to many things. It is the title of his new album released earlier this week. It is the title of his planned tour that never came into fruition. It is also a message to the audience because this really is it. This is the last time fans will be able to see him showcase his talent. But for me, it was more like, "This is it?" Jackson is a multi-layered man that has had a lucrative musical career and seen his fair share of media coverage detailing his extremely controversial life. The material for a real documentary that probes every facet of him is primed and ready to be put together, but none of that is in this. This is nothing more than a pretentious ego stroke, raising Jackson up as a god-like idol, and a loathsome capitalization on his death. Of course, it's also merely rehearsal footage. It's not like you're seeing a finished, realized version of what would have been his comeback tour. No, you are getting rough rehearsals that don't always look or sound all that great. There are mess-ups, there are blunders, sour notes are hit and Jackson isn't at his best, reserving his voice for the actual performances that never happened. The material just isn't all that interesting. The concert itself would have been an amazing spectacle I'm sure, but contrary to the title, this isn't it. However, with all of that said, there were certain song rehearsals that were a blast to watch, particularly the ones where a plethora of dancers were onstage with Jackson practicing their fanciful choreography. I also enjoyed the extra footage that was shot prior to his death that was supposed to play on a giant screen during the tour, like Jackson's incorporation into an old Humphrey Bogart movie and the new Thriller video. It's impossible to watch Jackson perform Thriller and not get excited because it is a truly awesome sequence, in large part due to the dance, which is one of the best and most recognizable dances ever choreographed. Jackson is surprisingly humble in the film, never truly losing his temper even when rehearsals don't go as well as he'd like. Even when he criticizes the people performing with him, it is always constructive and he finishes each criticism with the phrase, "with the love," meaning that what he says shouldn't be taken as anger or hate. He just wants everybody to perform as well as he knows they can. Granted, if there were moments where he did lose control, the filmmakers would undoubtedly leave them on the cutting room floor, but based on the footage shown, you get a new perspective on the always ridiculed man and come to appreciate him. This Is It isn't a bad movie because it's not really much of a movie at all. It's plainly shot rehearsal footage that was never meant to be seen by the public. While fans will enjoy it, I'm more inclined to pine for a real documentary on Michael Jackson, something that delves into the intricacies of his life, not this bland, and sometimes boring, rehearsal montage. Nevertheless, his fans will latch onto it like leeches and I do think there is enough here to please, despite its scarce content.